When Kiwan Richard won the Oxbridge Malaysia Essay Writing Competition 2012 it was a dream come true, for he had on many occasions participated in writing competitions only to come away empty-handed. This 17-year-old is no stranger to competitions. Over the years, he has taken part in district level English and Malay debates, drama competitions, choral speaking competitions, Dato' C.Q. 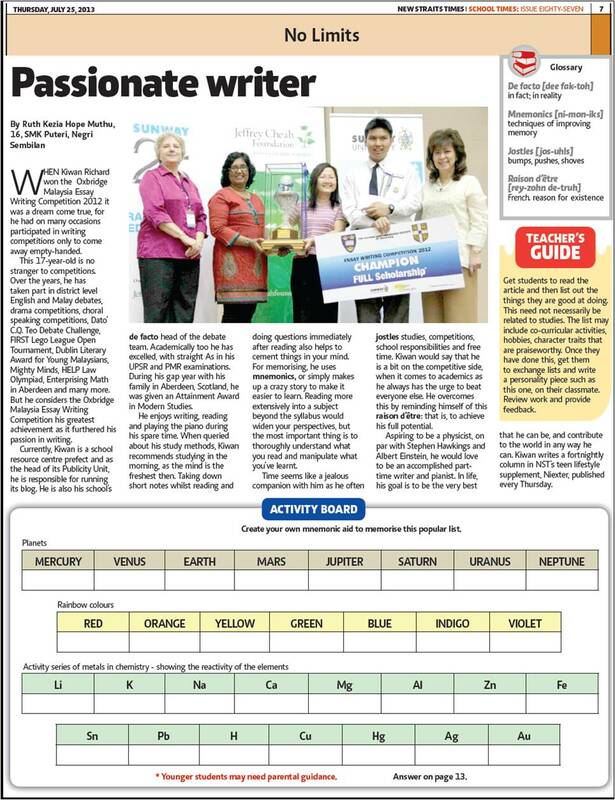 Teo Debate Challenge, FIRST Lego League Open Tournament, Dublin Literary Award for Young Malaysians, Mighty Minds. HELP Law Olympiad, Enterprising Math in Aberdeen and many more But he considers the Oxbridge Malaysia Essay Writing Competition his greatest achievement as it furthered his passion in writing. Currently Kiwan is a school resource centre prefect and as the head of its Publicity Unit, he is responsible for running its blog. He is also his school's de facto head of the debate team. Academically too he has excelled, with straight As in his UPSR and PMR examinations. During his gap year with his family in Aberdeen, Scotland, he was given an Attainment Award in Modern Studies. He enjoys writing reading and playing the piano during his spare time. When queried about his study methods. Kiwan recommends studying in the morning, as the mind is the freshest then. Taking down short notes whilst reading and doing questions immediately after reading also helps to cement things in your mind. For memorising, he uses mnemonics, or simply makes up a crazy story to make it easier to learn. Reading more extensively into a subject beyond the syllabus would widen your perspectives, but the most important thing is to thoroughly understand what you read and manipulate what you've learnt. Time seems like a jealous companion with him as he often jostles studies, competitions, school responsibilities and free time. Kiwan would say that he is a bit on the competitive side, when it comes to academics as he always has the urge to beat everyone else. He overcomes this by reminding himself of this raison d'être: that is, to achieve his full potential. Aspiring to be a physicist, on par with Stephen Hawking and Albert Einstein, he would love to be an accomplished part-time writer and pianist. In life, his goal is to be the very best that he can be, and contribute to the world in any way he can. 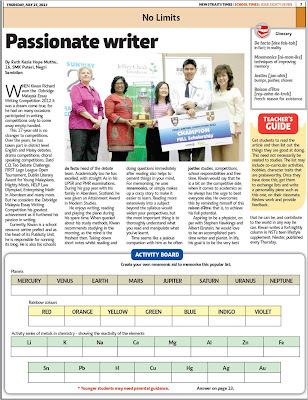 Kiwan writes a tri-weekly column in New Straits Times' teen lifestyle supplement, Niexter, published every Thursday. This post is part of the line-up ahead of the blog's second anniversary. All these posts will be taken from articles written by students featuring the school on School Times, the educational pull-out from the New Straits Times. 10,000 Views: Jump for Joy! A Horde of Minions on Sports Day? !